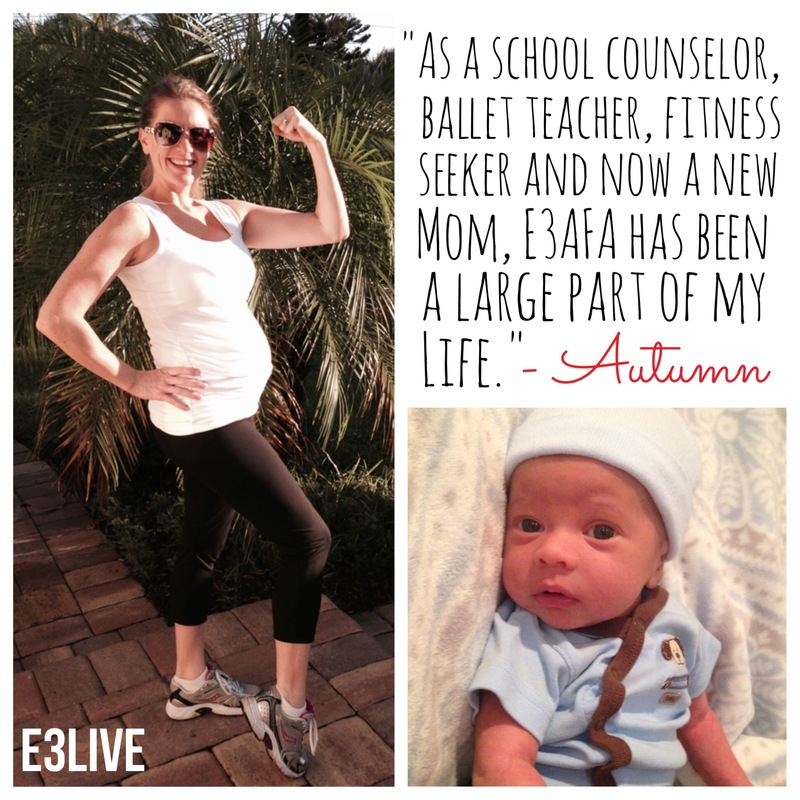 As a school counselor, ballet teacher, fitness seeker, and now a new mom; E3 has been a large part of my life. I initially began taking E3AFA for increased energy and nutrition. I currently take 2 capsules in the morning and 2 in the afternoon along with Prenatals and DHA. Throughout my pregnancy, I experienced no morning sickness. I had a healthy pregnancy, exercising and teaching ballet until the day before my baby was born. I recently delivered a perfect healthy baby boy. My baby is strong, lifting his head and rolling onto his side during his first week of life. I continue to take E3AFA while breastfeeding. We get soooo many calls into our office each week regarding the use of E3 with children. I can definitely recommend E3Live to everyone. Nicholas and Annie, my infants, have been getting E3Live by mouth (and through Mother's milk) since they were 2 days old. They were fed E3Live as pre-natal nourishment during the pregnancies. I certainly have angels in this world....(mothers donating breast milk) to help me feed our babies. 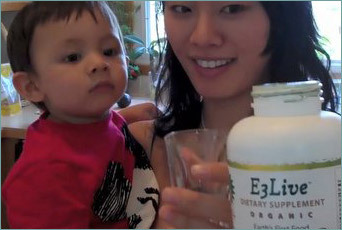 These moms consume E3Live to support nourishment for their body, and their baby! Nicholas and Annie really love E3Live and obviously, by their huge smiles, you can see they enjoy it each day. I now give E3Live to them in a bottle, or a cup, with a little water. 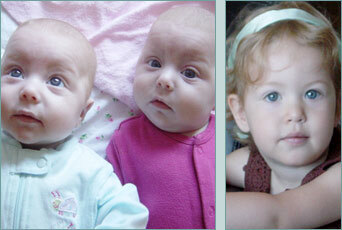 When they were first born, I used a syringe to slowly drip it into their tiny mouths. The syringe not only helped me measure the amount I was giving them, but it helped me control each drop. My children loved the taste of E3Live immediately. After all, they only know what taste I introduce to them! I don't think that it is coincidence - but both babies also seem to enjoy green vegetables over most other foods as they are being introduced to solids. I really think it is because of E3Live. There is NO DOUBT in my mind that I see RESULTS. They have not been sick since birth, even being exposed to people with colds and flu in public, and on airplanes. Strangers and friends comment how alert and vibrant they are. 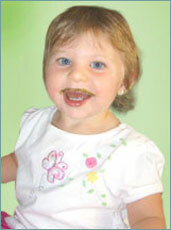 When around the babies even for a short period of time, people very often comment that they are very advanced mentally. I believe and have experienced that E3Live proves to be a whole body (immune) food. Their bodies are strong and I do believe their minds function at the highest level possible. I went through my entire pregnancy drinking E3Live Enhanced with BrainON, which kept my mind alert, awake and positive. I gave birth to very healthy baby boy. I am breastfeeding, and I believe it is thanks to E3Live that I have plenty of milk and no post-partum depression. We're in good spirits and good health. Besides, I have already lost all the weight I gained in pregnancy! As a wellness journalist, I am often asked whether E3 is safe for pregnant and nursing moms. On the bottle, it's written: 'Consult your physician.' Unfortunately, few physicians know about this beautiful gift of Nature. Naturally, they are afraid to recommend something they have not studied. I believe, E3Live is totally safe for pregnant and nursing moms. It should come highly recommended! It has not been designed by some kind of a brainy scientist. It was made by Nature! FOLLOW-UP NOTE: Evita's baby loves E3Live! 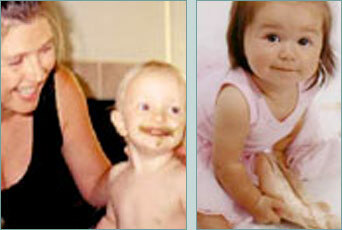 Author of Raw Food & Breastfeeding Books Gives Rave Reviews for E3Live & E3Live BrainON! 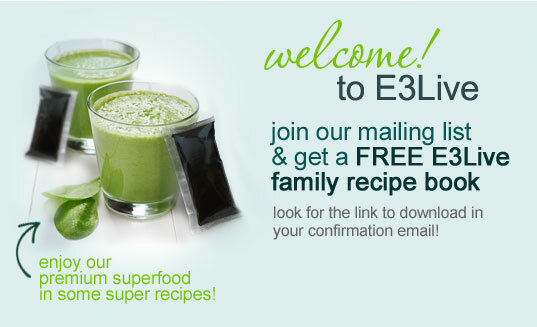 Some of the superfoods I enjoyed while breastfeeding were: E3Live frozen AFA and E3 BrainOn. I discovered E3Live while researching Tonya Kay‘s diet for our Raw Nutritional Analysis eBooks. Intrigued by the great feedback from raw experts such as Gabriel Cousens and Brian Clement, I gave the product a try and was instantly hooked. E3Live gives me great boosts of energy, mental clarity, and an intense feeling of joy.It is not cheap, and one serving costs about $2 per day if you take 2 Tbsp. per day as I do (the normal serving size is 1 Tbsp.). Do not feel like you are missing out if you cannot afford it, but if you spend $5 a day on store-bought coffee, you may get the same boost for less by ditching the caffeine and switching to blue green algae. Baby Refuses Juice Until E3Live Is Added! Haddar is 19 months old in these photos.I have been putting E3Live in her juice in the morning for about 3 months now. If I forget to give her E3Live, she will usually hands me back her cup of juice, refusing to drink it until I add the E3Live to it! I am writing you this letter in testament of E3Live products for children as we have witnessed first hand the profound, yet subtle affect it has had on our two year old Jana Aum Kleinberg as well as our three and half month old identical twin girls Naia and Ananda. We live a balanced lifestyle that includes a mostly raw vegan diet, regular chiropractic adjustments, meditation and regular exercise. E3Live is a staple supplement in our diet for ourselves as well as our three small children. We are frequently stopped in public and asked how old our daughter Jana is. People's first response is Wow, she speaks so clearly and she's so deliberate. We joke that Jana is two going on six! We have found that the use of E3Live dramatically improves her ability to focus and articulate. Not only is Jana advanced for her age but she also seems to be more emotionally stable then her peers. Her ability to communicate effectively lessens the frustration often leading to the temper tantrums associated with her age group. Jana also seems to be more confident and present then most in her age group. We recently took our three children to a pediatric physician for a check up on our (then) ten week old twins who were born six weeks premature. The physician commented on how alert and advanced all three children seemed to be for their age. Despite the twins' pre-maturity, they are advanced in social interaction and hand eye co-ordination all ready! Granma, the vitamin makes me fast and strong! I wanted to share our experience using the Renew Me product. 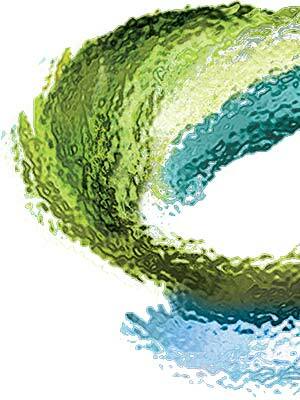 I ordered the Renew Me product for the first time approximately 3 weeks ago. I had read the reviews and had hoped we (my husband & I) would feel a difference, but I have heard product reviews before and never really felt what others claimed. FYI-My husband is a real doubting Thomas when it comes to natural products. Well, I FEEL AMAZING! And better yet, my husband who has had health issues for the last four years and had several major surgeries is feeling much better, has more energy and a positive attitude again. This has been noticed by our adult children as well as me and my husband (which is amazing since he is such a doubter). I can't tell you how thankful I am to have my husband of years ago coming back to his old self. People at work are asking me what I am taking or doing, they are committing on my energy level and positive brighter attitude. Our company initiated a step challenge and I work with mostly staff in their young twenties to mid-thirties; I am 60 years old and to date, no one is remotely close to my step count of at least 20,000+ per day. Mind you, I barely had the energy to complete a day at work three weeks ago, let alone walk. I am now excited to get to work by at 5 a.m. to park and head out on my 1.5 hour walk before coming into work and still have plenty of energy to spare. I am also losing weight due to my energy level, exercising and have new found motivation to eat mostly raw. I can't tell you just how very pleased I am with the clarity of mind I feel now, none of that foggy thinking going on like before. WOW!! It's been a life changing 3 weeks and I hadn't truly realized just how much so until I began writing this down. 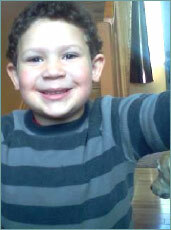 I would like to also share one other incident that happened with my grandson, Mosiah (5 years old). My grandson ran out of his gummy vitamins (provided by mom) and saw me taking my vitamins and said, Granma, I don't have any vitamins, can I have one of yours? I said, sure, but he could not swallow it so I put it in approximately 1oz of water and 1oz juice. He swallowed it and had no complaint about flavor. Approximately an hour went by and he was racing around the house in a playful manner and very cheerfully laughing. He buzzes by me and said, Granma, the vitamin makes me fast and strong! I recognize that young children seem to realize the effects of natural products long before adults do, but this was fast. Since I leave very early in the mornings for work I was unaware that my grandson was asking his Papa for Granma's vitamins every day until my husband told me several days later. I told Mosiah that his mom was going to buy more vitamins for him and said, which ones do you want her to buy you, the gummy ones or Granma's? He said, I want yours Granma, they make me feel good. God bless little children for their awareness and honesty about how things make them feel. He now takes the Renew Me also. I love E3live. I take about 1/4 cup daily and have seen the positive effects in a very tangible way. I had to go back to work so I began pumping breast milk for my baby. I would pump in the morning and fill a bottle rather quickly. Unfortunately I ran out of e3live and took my time reordering, after about a month of not taking it my milk supply went down and I was not only taking much longer to fill a bottle sometimes I couldn’t even fill it! After a month or so back on the E3live my milk supply came back up again!! I also notice that I have less of a sugar craving and more overall energy while taking e3live consistently. I work as a health counselor and I recommend it to all of my clients, from babies to adults- it is a great "real food" supplement! Thank You E3live for making a superior product with no fillers or cutting any corners for cost. You guys Rock!